#NOOK Daily Find! Three Books in the Guido Guerrieri Series by Gianrico Carofiglio @GianricoCarof for $1.99 each! ‘Three Books in the Guido Guerrieri Series‘ by Gianrico Carofiglio (Kensington) is available today at the specially discounted price of $1.99 each on the B&N Nookbooks site. 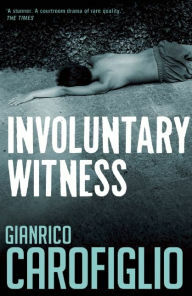 Award-winning novelist Gianrico Carofiglio worked for many years as a prosecutor specializing in organized crime before turning his talents to writing. Save over 80% on the first three books in his popular Guido Guerrieri Series — which includes his debut novel, Involuntary Witness — all just $1.99 each today! The Fianna Trilogy Series, Books 1-3 by Megan Chance (Skyscape) are available at the specially discounted price of $1.99 each on the US Kindle site. * For Canadians, click on this link for the discounted books! Grace Knox is about to turn seventeen, and the world of Victorian New York society should be opening to her—a time of dances and parties and boys vying for her heart and her hand. Instead, Grace’s world is closing in: the family business is gone; her brother is drinking and gambling away whatever is left; her widowed mother cannot cope; and her grandmother is slipping into madness. And now Grace is having disturbing dreams of ancient battles. Since Yesterday: The 1930s in America by Frederick Lewis Allen is $1.99! @OpenRoadMedia #Kindle #History Daily #Deal! FYI, be sure to also check out the new promo: Kindle Countdown Deals: Limited time discounts on Kindle-exclusive books! ‘Since Yesterday: The 1930s in America, September 3, 1929-September 3, 1939‘ by Frederick Lewis Allen (Open Road Media) is available at the specially discounted price of $1.99 on the US Kindle site. Also on Amazon CA. Published in 1940, Since Yesterday takes up where Lewis’s classic leaves off. Opening on September 3, 1929, in the days before the stock market crash, this information-packed volume takes us through one of America’s darkest times all the way to the light at the end of the tunnel. Following Black Tuesday, America plunged into the Great Depression. Panic and fear gripped the nation. Banks were closing everywhere. In some cities, 84 percent of the population was unemployed and starving. When Franklin D. Roosevelt took office in 1933, public confidence in the nation slowly began to grow, and by 1936, the industrial average, which had plummeted in 1929 from 125 to fifty-eight, had risen again to almost one hundred. But America still had a long road ahead. Popular historian Frederick Lewis Allen brings to life these ten critical years. With wit and empathy, he draws a devastating economic picture of small businesses swallowed up by large corporations—a ruthless bottom line not so different from what we see today. Allen also chronicles the decade’s lighter side: the fashions, morals, sports, and candid cameras that were revolutionizing Americans’ lives. From the Lindbergh kidnapping to the New Deal, from the devastating dust storms that raged through our farmlands to the rise of Benny Goodman, the public adoration of Shirley Temple, and our mass escape to the movies, this book is a hopeful and powerful reminder of why history matters. Oh, hey – be sure to pick up your new AmazonLocal Free Coupon to get up to 30 select Kindle books from the Amazon Kindle Store for $1.99 each! Here’s a GREAT AmazonLocal deal! Claim your free voucher worth $30 OFF a Kindle Fire HD 8.9” Wi-Fi 16GB at your AmazonLocal page! Coupon is only valid for a $30 discount off the regular price of 1 Kindle Fire HD 8.9” Wi-Fi 16GB tablet with Special Offers ($229) or 1 Kindle Fire HD 8.9” Wi-Fi 16GB tablet without Special Offers ($244) purchased only from Amazon.com.